Find the perfect door accent with our exclusive screen and storm door hardware. From screen door latches to complete lock sets, our screen door and storm door hardware will create just the look you need for your home restoration project. The nostalgic Amsterdam design recalls the Dutch colonial hardware of the Hudson River valley. 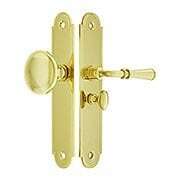 Beautiful, durable and finely crafted from forged brass, it features a true mortise latch with thumb-turn lock bolt. A wonderful choice for Colonial or Craftsman style homes! Spare but always stylish, the New York latch set suits any screen door. 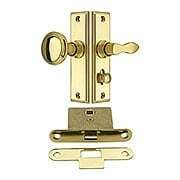 Beautiful, durable and finely crafted from forged brass, it features a true mortise latch with a sliding privacy lock. A long spindle makes this a great choice for thicker than usual doors. This petite version of our New York screen door set features an easy-to-install tubular latch. 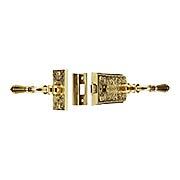 Combining classic design and solid brass construction, it's a favorite choice for homes of every style. 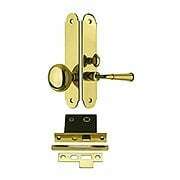 Set includes a handy privacy latch and is reversible. 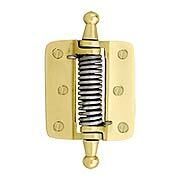 This premium quality screen & storm door hinge is forged from solid brass with a heavy-duty stainless steel spring. The classic ball tip design goes with any style of home, from High Victorian to Mid-Century modern! Choose from 7 traditional finishes. 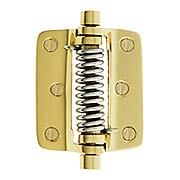 This heavy-duty spring door hinge will close your door with an old-fashioned "Bang"! Made from solid, cast brass with a strong steel spring, it's great for high-traffic entries. 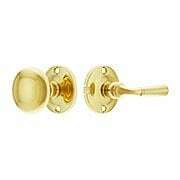 Stocky button finials give your door a charming vintage look. Our tightly tailored Swarthmore set is a timeless choice for any screen door. 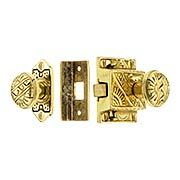 Beautiful, durable and finely crafted from forged brass, it features a true mortise latch with thumb-turn lock bolt (also offered in a dummy set). Choose from an array of stylish finishes! 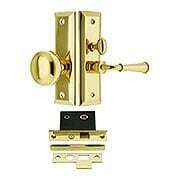 Solid brass construction, timeless style and 5 classic finishes make this our most popular screen door latch. The clean and simple design goes with everything, from Colonial Revival to Mid-Century. 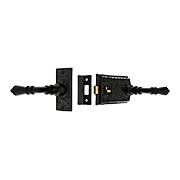 Set includes a handy privacy latch and is reversible. 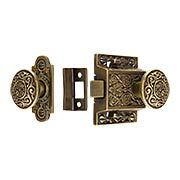 Ornate cast brass hinges add a delightful Victorian touch to any screen door. This handsome reproduction features charming acorn finials, a fanciful leaf pattern, and a choice of dark bronze or brass finishes. 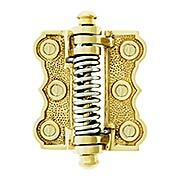 The strong, enclosed spring closes your door with a resounding "bang"! 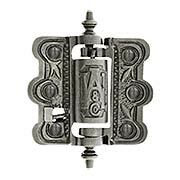 This striking screen & storm door hinge is reproduced from a late Victorian original. Made of durable and non rusting cast brass, it features a heavy duty steel spring that brings your door quickly to a close and holds it tightly in place. The hinge leaves are surface mounted to the door and the adjacent flat casing, making installation a snap. Offered in lacquered polished brass, polished nickel, antique brass and oil rubbed bronze finishes. Why reserve elegant Victorian design for your home's interior? This ornate 1890s style latch adds a gracious touch to even the humblest screen door. Surface mounted, it's easy to install (just drill for the spindle) and includes a decorative surface strike and a plain mortise strike. The latch features a handy privacy lock, which is great for keeping in pets & small children! 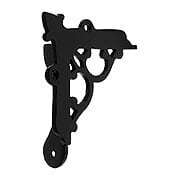 Reproduced in cast iron with your choice of matte black or lacquered antique iron finishes. Vintage Victorian style at an economic price point! This 1880's screen door latch features a classic Eastlake design. Surface mounted, it's a breeze to install and includes two strike plate options (decorative surface mount and plain mortise). 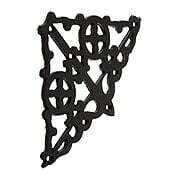 Reproduced in cast iron with durable black powder coat. This striking screen & storm door hinge is reproduced from a late Victorian original. Made of durable cast iron, it features a heavy duty steel spring that brings your door quickly to a close and holds it tightly in place. The hinge leaves are surface mounted to the door and the adjacent flat casing, making installation a snap. Choose from a matte black powdercoat or a lacquered antique finish. 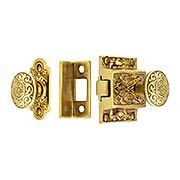 Ornate cast brass hinges add a delightful Victorian touch to any screen door. This handsome reproduction features charming acorn finials, a fanciful leaf pattern, and our exclusive Antique-by-Hand finish. 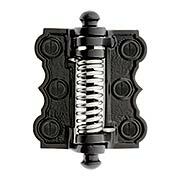 The strong, enclosed spring closes your door with a resounding "bang"! Why reserve elegant Victorian design for your home's interior? 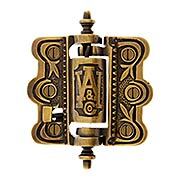 This ornate 1890s style latch adds a gracious touch to even the humblest screen door. Surface mounted, it's easy to install (just drill for the spindle) and includes a decorative surface strike and a plain mortise strike. The latch features a handy privacy lock, which is great for keeping in pets & small children! Reproduced in durable, non-rusting cast brass. Our tightly tailored New York set is a timeless choice for any screen door. 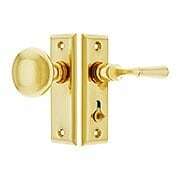 Beautiful, durable and finely crafted from forged brass, it features a true mortise latch with thumb-turn lock bolt. Choose from an array of 4 stylish finishes! Top quality wooden screen doors deserve premium quality hardware. This Colonial style lock set will not disappoint. 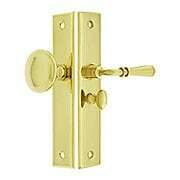 Beautiful, durable and finely crafted from forged brass, it features a true mortise latch with thumb-turn lock bolt. Choose from an array of 4 stylish finishes! Vintage Victorian style at an economic price point! 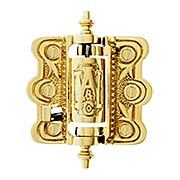 This 1880's screen door latch features a classic Eastlake design. Surface mounted, it's a breeze to install and includes two strike plate options (decorative surface mount and plain mortise). The latch features a handy privacy lock, which is great for keeping in pets & small children! Reproduced in solid brass with your choice of polished or antique finishes. Why reserve elegant Victorian design for your home's interior? 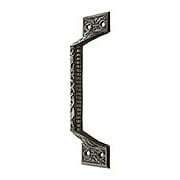 This Ornate Screen Door Corner Brace adds stability to your wood screen door while adding a decorative touch. Reproduced in cast iron with your choice of matte black or lacquered antique-iron finishes. Why reserve elegant Victorian design for your home's interior? 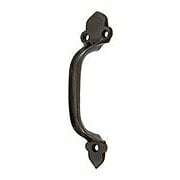 This Screen Door Corner Brace adds stability to your wood screen door while adding a decorative touch. Reproduced in cast iron with your choice of matte black or lacquered antique iron finishes. Why reserve elegant Victorian design for your home's interior? 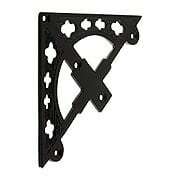 This Flush-Mount Screen Door Corner Brace adds stability to your wood screen door while adding a decorative touch. Reproduced in cast iron with your choice of matte black or lacquered antique-iron finishes. 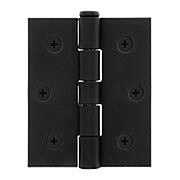 Whether your home is rustic, contemporary or somewhere in between, our ruggedly simple iron hinges are a great choice. The surface is phosphate treated then lacquered, for rust-resistant, long-lasting wear. With removable, stainless-steel pins, they are an ideal replacement for screen doors with a closer. 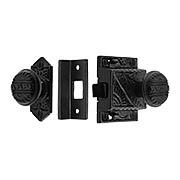 This very small cast iron rim latch is ideal for narrow French doors and exterior screen doors. 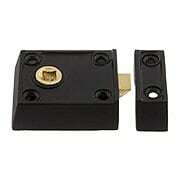 The latch is only 2 3/8" wide and works best with small brass or porcelain knobs, or lever handles. 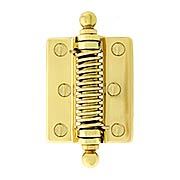 Charming and versatile, it's a handy latch for closets, linen cupboards and wardrobes, as well! Finished with a durable matte black powder coat.